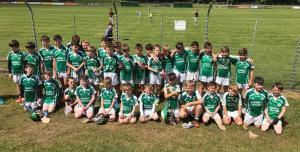 On Saturday last the 16th of June for the sixth year the juvenile section of Ballincollig GAA Club held the under 11 hurling tournament, The Joe Delaney Cup. Clubs involved were Ballincollig, Na Piarsaigh from Limerick, Ballyboden St. Enda’s of Dublin, and James Stephens of Kilkenny, each Club brought 3 teams with them and in all approximately 160 boys took part. The day itself was a fantastic success, the good weather played its part and was a welcome bonus, the conditions were perfect for summer hurling(Joe was obviously beaming down on us). As a Club we can be very proud of ourselves, with all Clubs going away congratulating us on putting on a thoroughly enjoyable day for everyone. A huge thanks needs to go to everyone who helped make this wonderful day happen, from people making teas, coffees and sandwiches to the referees, to the grounds staff who had our pitches in perfect order and everyone else who came down to help on the day. The competition itself it has to be said was played at an exceptionally high standard. Watching the skills on display from all Clubs, the future of hurling has nothing to worry about. 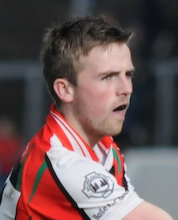 The final round of games had Ballincollig trailing James Stephens and Na Piarsaigh by a couple of wins and although Ballincollig won two of their remaining games against Na Piarsaigh to finish second in great style, James Stephens held out against Ballyboden to take the Cup back to Kilkenny. Congratulations to James Stephens who ended up victorious bringing the Cup to Kilkenny for a fourth year where it now resides again in Delaneys Bar, considering the calibre and traditions of the clubs we were playing against this was a fantastic achievement for the Ballincollig team and one that bodes well in moving our own Club forward in the GAA world. A couple of boys to note were Michael Delaney Joe’s grandson who lined out for Ballincollig and Ruari O Donoghue, Tom “the badger” O Donoghue’s grandson who lined out for Ballyboden St Enda’s, both boys were excellent and it was great to see past members being represented and remembered through this tournament. Again thank you to everyone who got involved, there was no shortage of volunteers and supporters and it was wonderful to see the Club and community spirit working so well together. And of course well done to the wonderful under 11 Ballincollig team, ye represented the Club magnificently, we are all so proud of ye.